WordPress 3.4 - What's new? 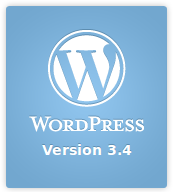 WordPress 3.4 – What’s new? Long period of waiting for the new WordPress 3.4 version was finished: if you were starving to get it, touch it, install it on your site, if you almost lost your patience, skipping all those beta 1, beta 2, Release Candidate 1, RC2 releases, if you even tried it at test environment, but still waited that great moment, when you could take it out of the box and put it to the live environment, if, finally, even some little part of written above is about you – we all together have very good news last week – WordPress 3.4 is here, with us! Download it, install it, use it, grow with it, and help to make it better :)! What’s new in WordPress version 3.4? – and a lot of changes under the hood, not so easy visible as others, but very useful for developers. WordPress version update is easy as ever. Just click update link and the rest part WordPress will make for you itself. Just few click stays between you and the latest WordPress version. I updated my sites to WordPress 3.4 already. And you? Short review of new WordPress 3.4 features is placed to “About WordPress” section. Click on WordPress logo at the top left corner to check that information. This entry was posted on Saturday, June 16th, 2012 at 06:48	and is filed under WordPress. You can follow any responses to this entry through the RSS 2.0 feed. You can skip to the end and leave a response. Pinging is currently not allowed.